Santa Fe, NM – In 2018, the Santa Fe Century will be held on May 20. The event will include a new 100-mile route for the Century ride and Gran Fondo timed race. The 100-mile course will be re-routed to avoid road construction on Country Road 41 near Stanley. From there, the route returns to Highway 14, aka the Turquoise Trail, where it turns at County Road 42 and follows the 50-mile course to Galisteo and back to Santa Fe. Additionally, there will be an all-dirt ride that will follow a 20-mile out and back course from the Santa Fe Community College Campus to the Spur Trail and then along the Santa Fe Rail Trail until the turn-around at the crossing with Avenida Eldorado, where a food stop will be located. The Santa Fe Century is one of the west's premier centuries. It will be heldon on May 20, 2018. Photo courtesy Santa Fe Century. The Santa Fe Century will be partnering with Santa Fe Community College (SFCC) to relocate its annual rides and races to the College’s campus at 6401 Richards Avenue beginning in 2018. Because it was so popular last year, the Century will host the second annual Vintage Bike Pageant and Celebration in 2018. The Century is partnering with Classical Bicycles of New Mexico – an informal group of bicycle collectors and vintage bike enthusiasts – in spotlighting vintage or historic bikes built circa 1987 or earlier. The vintage bikes also known in Italian as “Bici Eroiche” will be the focus of a special pageant or “Concours d'Elegance” on Saturday, May 19th during registration and packet pick up. The pageant will be an opportunity to see these vintage bikes up close and meet the owners. All bicycles displayed in the “Concours d’Elegance” will receive a commemorative number plate for registering as a “Vintage Bike Rider.” And, at this year's Concours, all qualifying bicycles will be eligible to win a “Best Of Show” trophy, as well as a “People’s Choice” award, which will be determined by the voting public, and a a special award from Eroica California. In order to be a part of in the Concours de’ Elegance, vintage bike owners are encouraged sign up for one of the Century’s rides or races that take place the following day, Sunday, May 20, 2018. Riders of vintage bikes are encouraged to dress in period style clothing – although ASTM approved helmets are mandatory for all riders. 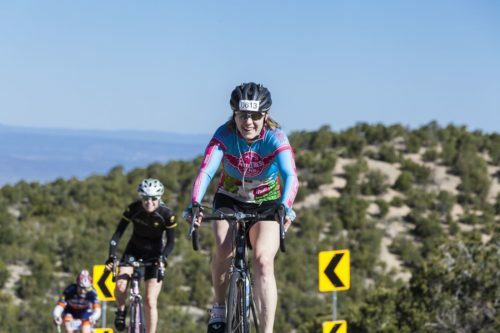 The Santa Fe Century is the first major cycling event in the spring in the Southwest and is open to riders of all ages and abilities. The weather in May is moderate and provides an opportunity to shed winter gear for warmer riding in Santa Fe. The Century features four well-stocked food stops manned by volunteers who return year after year. Following the rides and races, all cyclists can celebrate their accomplishments with a massage as well as award-winning BBQ provided by Cowgirl Restaurant, New Mexico micro-brewed beers from Canteen Brewery and live music at the beer garden. Age-category winners of the Gran and Medio Fondos will receive medals and the overall top three male and female winners will receive cash awards. Century Bank is generously providing the funds for the cash awards. For more information, visit www.santafecentury.com.